Product and ordering information for the seripettor pro wiping-seal bottletop dispenser for dispensing a wide range of reagents commonly used in biological and chemical laboratories. The seripettor® pro is a bottletop dispenser designed to handle a wider range of liquids than the regular seripettor® for customers who do not require all the features of the Dispensette®. Like the regular seripettor®, it features an easily-replaceable wiping seal dispensing cartridge, making it especially suitable for liquids that tend to form crystals. Its pump assembly has a corrosion resistant spring and an opaque upper sleeve to protect reagents from UV-light during dispensing, while allowing for observation of reagent to confirm purging of bubbles. 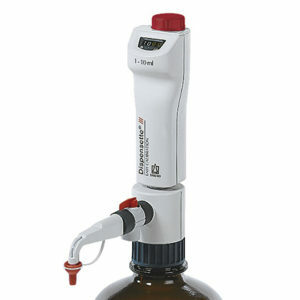 The seripettor® pro mounts on most common reagent bottles with its 45mm thread. 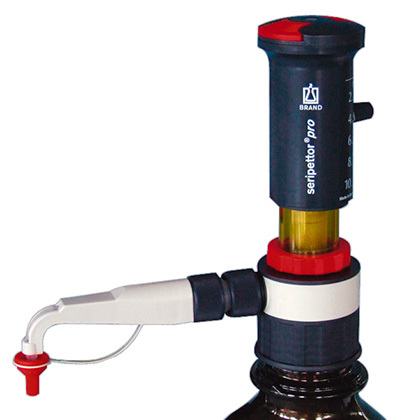 The seripettor® pro bottletop dispenser is supplied with: spare dispensing cartridge, discharge tube, telescoping filling tube, three PP adapters (45/38mm, 45/33mm and 45/S40mm), operating manual, and one-year warranty. *The value of accuracy and coeffficient of variation are final test values referring ot the delivered nominal volume, instrument and distilled water at equilibrium with ambient temperature (20°C/68°F) and with smooth operation. 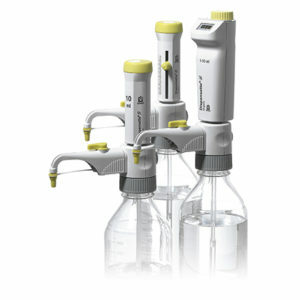 What liquids can I dispense with my seripettor® pro? 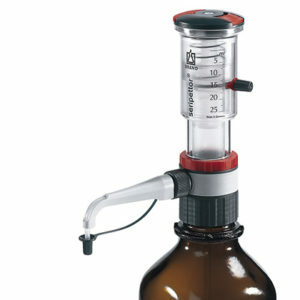 Bottletop Adapters - Thread adapters, available in PP and ETFE, ensure compatibility with most reagent bottles. Dispensing cartridges - Replacement cartridges, available non-sterile or sterile. Flexible Discharge Tubes - Simplify repetitive dispensing tasks. Flexible discharge tubes feature 800mm of coiled PTFE tubing and an integrated safety handle. Not for use with peroxides. Telescoping Filling Tubes - Made from FEP, telescoping filling tubes are adjustable to maximize reagent use in most bottles. 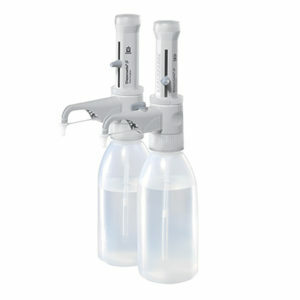 Dispensette® III Bottletop Dispenser – Replaced by Dispensette®S!